The Mount De Sales relay including Edeline Davies, Isabella Whittaker, Samantha Facius, and Juliette Whittaker with the freshmen Juliette Whittaker clocking a swift 2:08.9 800 meter anchor leg split. Whittaker also finished runner-up the freshmen mile this weekend at 4:59.40. Other All-American finishes in the championship events included the Bullis girls in the 4x200 meter relay (4th, 1:41.45) and 4x400 meter relay (3rd, 3:45.91), Northern Calvert girls in the 4xmile relay (3rd, 21:06.49), McDonogh School's Jada Seaman in the long jump (3rd, 20-5), Oxon Hill's Sarah George in the shot put (6th, 44-4), and Northwest's Taylor Wright (5th, 5-8.75) in the high jump. 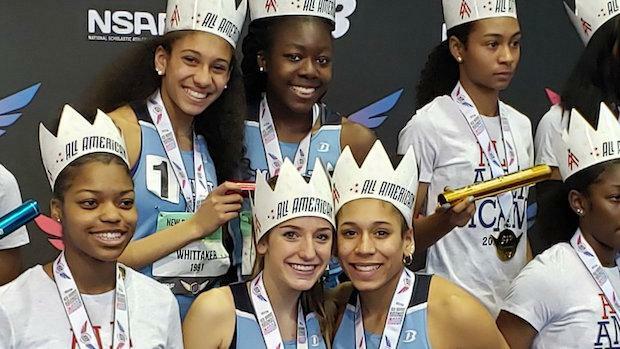 Below can find girls results from all Maryland athletes and relays at the 2019 New Balance Nationals Indoor. Let us know if missing any performances.